When the temperature in a room falls below the thermostat setting, hot water is circulated by the boiler. It is pumped through a system of pipes to the baseboard heater. At the core of the heater is a copper pipe with aluminum fins attached. Because of the increased surface area of the aluminum fins and the effectiveness of copper as a conductor, the heat is efficiently transferred from the water to the air in the room. When the heat has been released, the water is returned to the boiler to be re-heated, and so the cycle is continued. 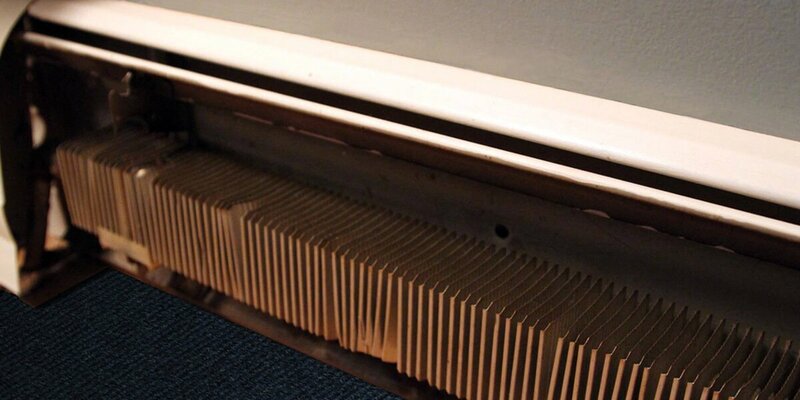 Because there is little air movement involved in the heat transfer the baseboard heater doesn’t blow dust around a room but it does attract dust to itself which then settles on the fins and reduces the system’s efficiency. Thus, it is important that a baseboard heater is properly cleaned at least once a year. • Lower (or switch off) the thermostat in the room. • Remove the front cover of the baseboard heater. • Make sure there’s space beneath the fin tubing and that there are no obstructions. • Using a brush nozzle, vaccuum the dust off the fins—remembering to reach under the fins as well as cleaning the top and outer surface. • Inspect the fins for any damage—if any fins are bent out of shape, gently re-straighten them with a flat blade and pliers. • Re-attach the front cover, making sure the louvre vents are open. • Return the thermostat to the desired setting.